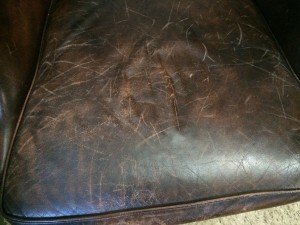 There are two main types of leather used in upholstery. Pigmented leather , which is probably the most popular around comes in a wide variety of colours. The other leather is aniline. This only tends to come in more natural colours – normally browns. Its important that you know what leather type you have as they need to be treated differently by you and also can be cleaned and restored in different ways by me. There are a few simple tests that you can do to help identify what leather type you have. This is not an exhaustive list and if at the end you are unsure then perhaps you need a qualified leather cleaning technician to assist with the identification. Anyway. The first thing to do is to look at the colour. is it a natural shade or is it a brighter colour or perhaps white. The brighter colour might indicate a pigment leather. What does it feel like. Aniline leather tends to feel warmer and softer than pigmented leather. Draw a fingernail lightly across the surface of the leather. Does it scratch? If so that would tend to indicate that its aniline leather. Finally put a small amount of water, just a few drops, in an out of the way place. Does it absorb into the leather? If so this would indicate an aniline leather. So. If its a non natural colour and feels somewhat cold and hard it would indicate pigmented. If on the same leather you cannot scratch it and then it does not absorb water you can pretty safely assume its pigmented and clean accordingly. On the other hand, if your leather is a brown or natural colour and feels soft and warm to the touch it indicates aniline. if the leather scratches and absorbs water that pretty much confirms it. Next you need to think about how to care for and clean your leather. 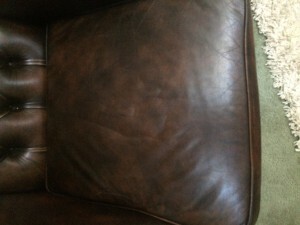 Pigmented leather cleaning should only be done using specialised products. Any suggestion that you can clean leather with other cleaning products or olive oil or baby orWD40 or whatever other suggestions you can hear on the net and elsewhere is rubbish – plain and simple. All of the above can and will damage the surface of the leather. The damage may be microscopic to start with but will lead to the breakdown of the surface eventually and potentially will be unrepairable. There is no need to use any form of conditioner on this type of leather as it cannot permeate the pigment layer to get to the actual leather so is a waste of time. Aniline leather is more open without the protection of the pigment layer. This means that you should only use an aniline cleaner as any other type of leather cleaner will be too harsh and lead to permanent damage. It also means that any stains will penetrate into the leather and are likely to be harder to remove. This type of leather will benefit from conditioning but again you must be sure that the conditioner is suitable for aniline leathers as many conditioners contain oils that can damage or stain the delicate aniline leather. 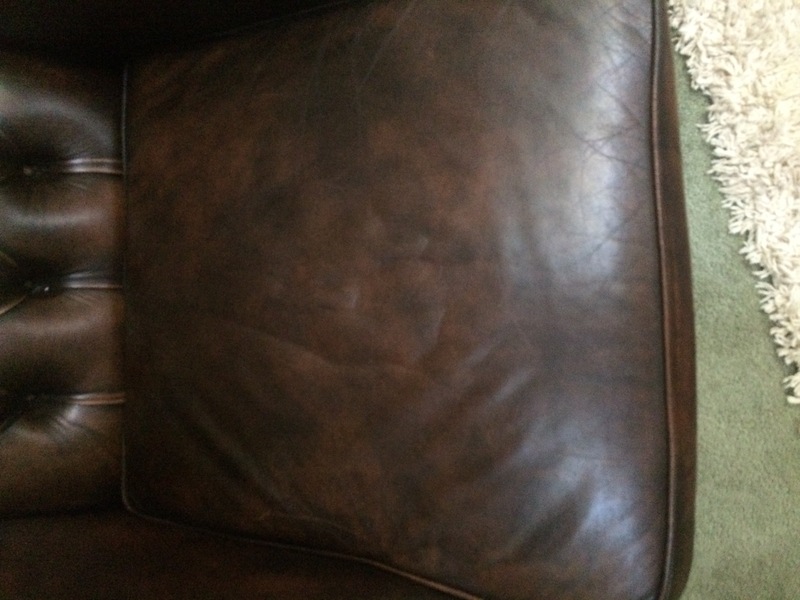 Whilst there are products on the market to clean your leather the reality is that most leather cleans involve some degree of restoration to get rid of stains or damage. That work should only be carried out by a qualified leather repair technician. There are many cleaners out there offering to clean leather. To most of them this article would be an education as it contains far more than they already know. 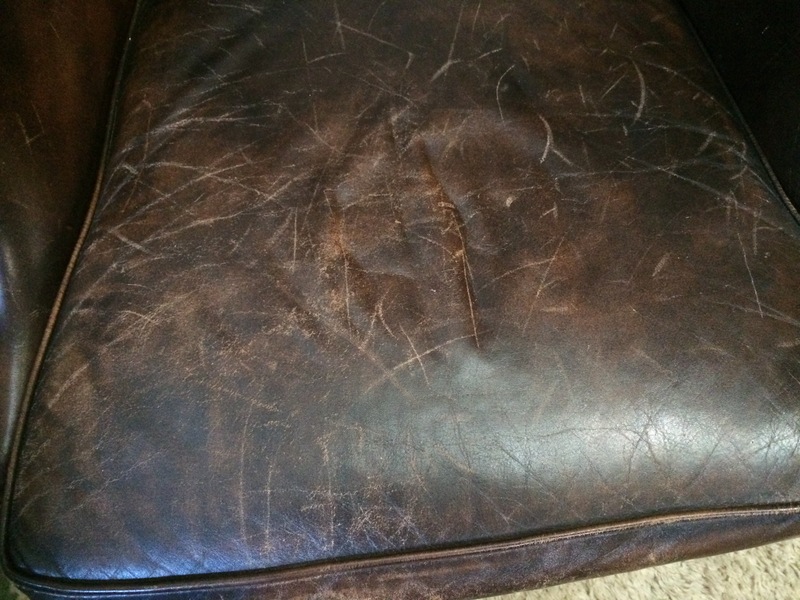 They will simply slop some leather cleaner on your leather, rub it in, tell you that you need a conditioner and then leave you with a poorly cleaned piece of furniture, cleaned with probably an inappropriate cleaning solution, and areas of damage gone unrepaired. I have a large white leather sofa which requires cleaning and restoring in some areas. Are you able to view and offer a no obligation quote? Not sure you got my previous message. More than happy to come and have a look and give you a quote. Let me know your address and when is convenient to attend.